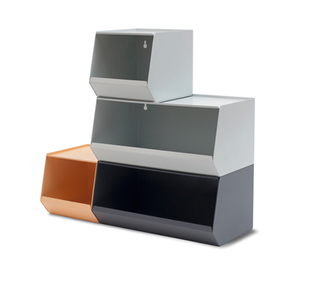 SALUT is a series of storage boxes inspired by the industrial functionality and cleverness of a semi-open container. 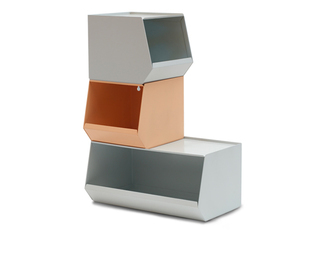 SALUT translates this functionality into a product for the private household. 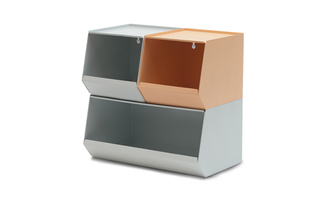 It comes in two sizes, is stackable and made of folded metal sheet. Thanks to two slotted holes it can be hung easily on the wall in the kitchen, corridor, bathroom or in the work space. 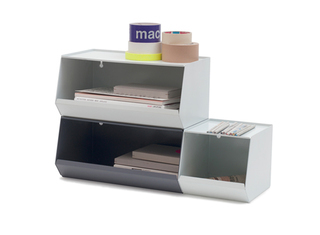 As an open, modular and pleasant storage system SALUT supports the flexibility and mobility of its user and keeps objects organized but at hand.